Hawkbus ehf uses Google AdWords conversion data. Conversion tracking is the process of identifying and recording the actions of people who visit and navigate through web sites. Conversion tracking usually operates by placing cookies on the visitor’s computer when they visit specific web pages and take certain actions (such as purchasing an item). The purpose is to discover when, where and how many times the visitor has viewed and interacted with the web page(s) and if they take a desired action like placing an order online. 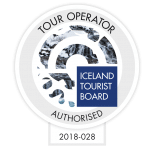 Hawkbus ehf is authorized by The Icelandic Tourist Board.